Nice! I rarely ever fry anything, but will try this sometime! Super crispy vadas, prefect for evening snacks. Nice. I have two fresh corn cobs with me for me to experiment. Looks so good ! Will try it out sometime. Very crispy n yummy vadas. vada looks crisp and delicioua.like the addition of corn in it.. Delicious! 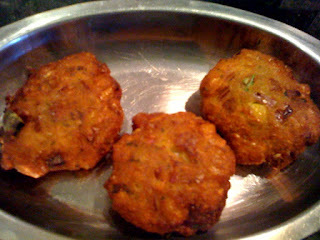 These vadas look great :) What a nice idea to put corn in them!